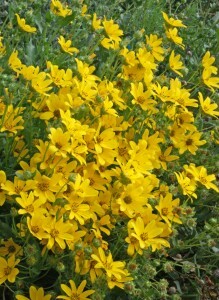 Engelmann’s daisy is one of the most adaptable plants native to the great North American Steppe. The plants will thrive in any type of garden condition except for deep shade. This sturdy yellow daisy will give just the right amount of height to your xeric perennial border, and will be the work-horse of your pollinator garden. Engelmann’s daisy occurs naturally in Colorado, New Mexico, Arizona, Texas, Arkansas, Kansas, Oklahoma, and South Dakota. The fuzzy cut green foliage adds an interesting lush texture to the very dry garden. Flowers open in the afternoon and bloom through the night eventually fading and recurving in the hottest part of the day. These wildflowers are a favorite of grazing herbivores and will disappear from overgrazed meadows. Deadheading will help increase and maximize the longevity of the bloom season. This bright sunny perennial is sure to be a favorite of habitat gardeners and will bring plenty of color and life to your garden as well.